In 2013, I have been pursuing my carcolors theme enthusiastically. The more I delved into this topic, the more fascinatingly distorted reflections I discovered on the shiny bodies of cars. Becoming aware and conscious of these motives opened an entirely new and unique look at cars. However, it reached a point where I perceived my environment almost exclusively through carcolor reflections. It became like an obsession and I thus imposed a carcolor break on myself in 2014. Last year, I have thus hardly created any carcolor photograph at all (there were a few relapses), but the year of carcolor abstinence proofed that I really enjoy and miss discovering my surrounding through carcolor reflections. I am thus happy to recommence creating and showing carcolors. 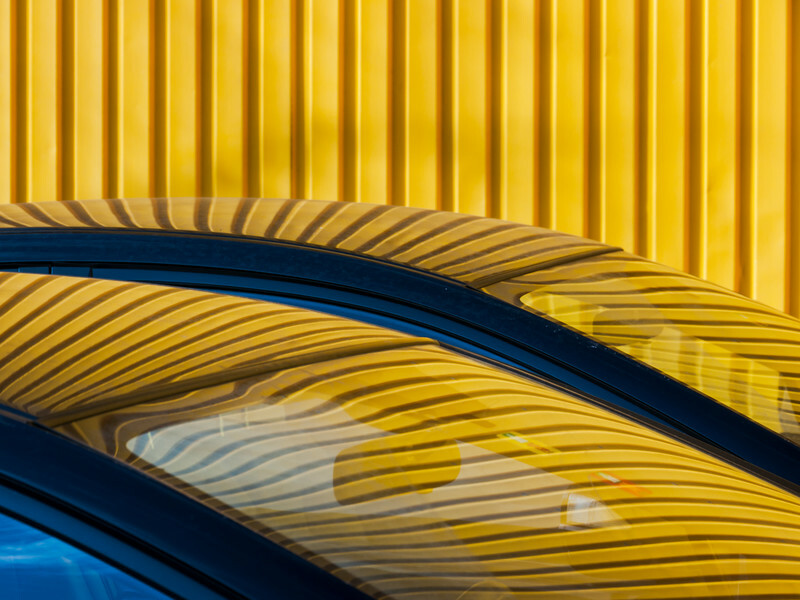 The yellow windscreen carcolor composition shown here has been created recently, at a nearby building, where I have already found an interesting carcolor reflection earlier.